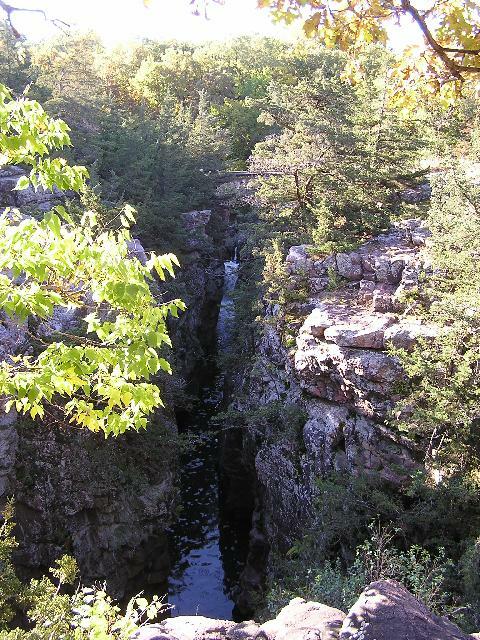 Directions: From Garretson, South Dakota, take Route 11 north a few miles to the Devil's Gulch State Park on the right (east) side of the road. Follow the signs to the park. There are trail maps at the visitor center. The trail to the falls is from the large sign near the visitor center. 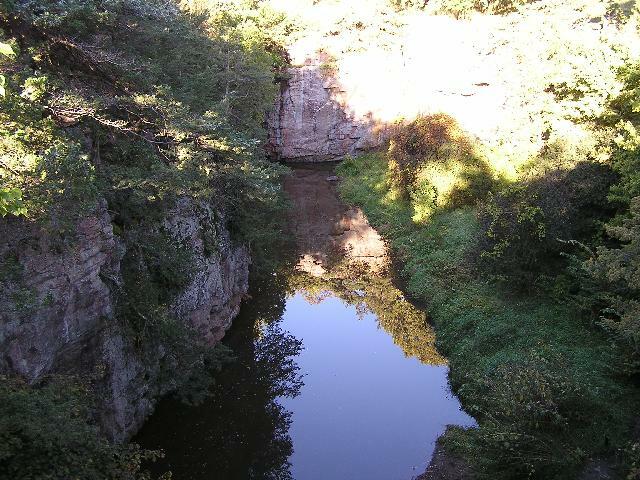 Notes: I visited Devil's Gulch Falls on September 27, 2006. The visitor center was not open when I visited the falls, so I did not have a trail map. 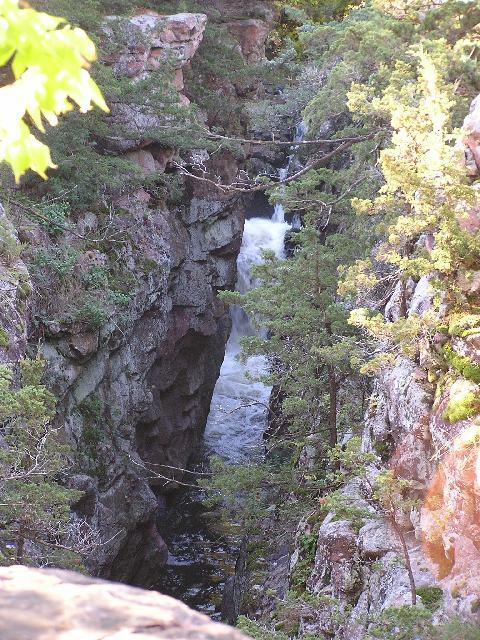 We crossed the bridge and followed the trail to the right going upstream toward the sound of the falls. We were able to see the falls from a distance. It appeared there was another bridge closer to the falls from another trail, but as we were short of time, we didn't look for that bridge. 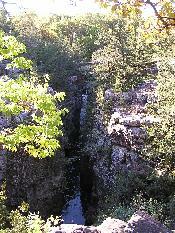 The first photo shows the falls from a distance, with a zoomed in view of the falls in the second photo. 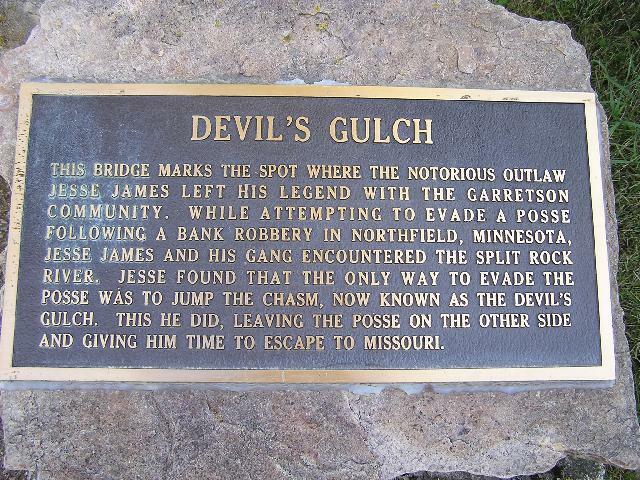 The third shows a sign near the falls telling the story of when Jesse James jumped the gulch to escape from a posse chasing him. The final photo shows the gulch from the bridge crossing it. Page last updated 31 Dec 2006.